The International Cannabis Business Conference (ICBC) strives to provide the latest pertinent information on cannabis laws and our event in San Francisco is no different as we are proud to give the California cannabis community the latest on the upcoming new rules and regulations. 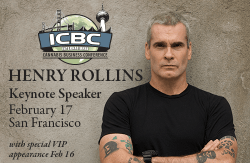 Additionally, we do our best to provide an outside-the-box perspective and this year’s keynote with punk rock icon Henry Rollins definitely follows in that tradition. Rollins has such a unique perspective on our culture and society and we are happy to bring his message to the cannabis community. Be sure to check out the full interview the Chronicle’s David Downs. We are so pleased with our lineup for our San Francisco conference, and want to thank all of our speakers, attendees and exhibitors. Up next, is our Berlin, Germany, conference on April 10-12, so please stay tuned for more exciting news. This blog was originally posted at www.internationalcbc.com and has been published here with special permission.